Joey Bada$$’s major-label debut is/was a massively anticipated piece of music, following two strong mixtapes, a collection of guest spots, and tours with the likes of Disclosure, B4.DA.$$ was perfectly prepped for an early 2015 release- January 20th: his birthday. 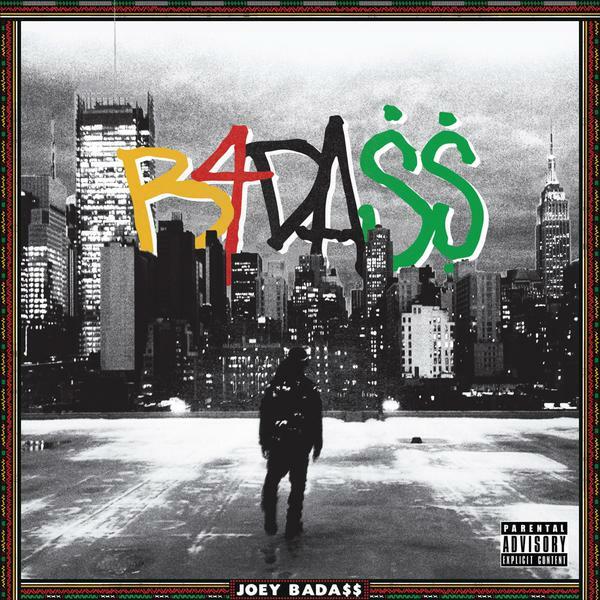 Joey Bada$$’ debut album features production from legendary names such as DJ Premier and J Dilla, as well as having guest spots from Maverick Sabre, BJ The Chicago Kid, Raury and more. Despite the cryptic title, B4.DA.$$ is an excellent album. Much like PRhyme’s debut project, B4.DA.$$ is a no-frills all-out rap album. In terms of composition, structure and aura, it nods at rap gems such as Black On Both Sides and Illmatic. The production is noticeably complimentary, with evidence of Bada$$’ involvement abundantly clear, it’s a particularly effortless match up of vocals to instrumentals. Chopped up piano keys on Big Dusty, a plethora of infectious record scratches on Save The Children, punching ‘lyric fajitas’ on Christ Conscious, the album really is a cracker. Slotting somewhere in between Kendrick Lamar and A$AP Rocky from a flow and vocal point of view, Joey Bada$$ is a versatile emcee capable of adaptive flows across the entirety of the LP, the album doesn’t fall flat or become monotonous like a lot of rap debuts nowadays. B4.DA.$$ has an array of timeless jams, Like Me and O.C.B. stand out as some of the most memorable rap songs I’ve heard in a while, and having been a fan of Bada$$ since he first came to prominence, I’m glad to see a young rapper maintain the quality on earlier projects through to their major-label debut. Fusions of jazzy horns, excerpts of kerb-side conversations a-la–Good Kid, Maad City and some indisputably fire raps from the man himself makes B4.DA.$$ an incredible album to kick off 2015 with.